Feel confused by food sometimes? Yeah, I hear you sister. It’s no joke. If only there was a easy way to just know what to eat more of, what to avoid, and where to find the good stuff– — no matter where you are (in the world), and what’s going on in your day. Like a private consult, but at your own pace, and a totally affordable price point. With weekly assignments to keep you accountable and on task, and a go at your own pace sequence so you can start and stop anytime you want. This program is the crux, the gold of everything at Simply Real Health- both in philosophy and real life practicality! This program will change your life, completely. Great for gifts, or as beautiful long lasting investment in yourself, and those you feed. 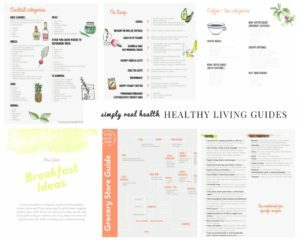 It’s everything you need to know to start living a real-food lifestyle. 4 STEP-BY-STEP EASY COOKING VIDEOS FOR MASTERING REAL FOOD! 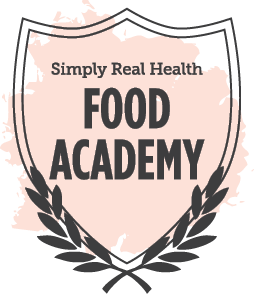 Special bonuses and private discounts for all other Simply Real Health programs as they roll out (seasonal meal plans, the group program, etc). All for just $297.It’s a killer, screaming deal on purpose.